In Basic Setup Builder the variables are much more than text or numbers containers. They are your interfaces to data sources. Define your data source variables and use them everywhere you need! Do you want to display over the installer form an image that is on your site? Just create an URL variable that points to your image and assign it to the source property of your image control. Is your image compressed into a remote cabinet? Let the URL variable point to the cabinet file and create a Cab extracted variable that will receive its output. Then assign the output of the Cab variable to the image control. It's easy. All the Basic Setup Builder variables can be nested without limits. They can accept as input the output of other variables and so on. All of them are protected against recursions. More over, an internal cache automatically maintains local copies of the actual value of some kind of variables, preventing the installer from unnecessary repetitions of their loading procedures (for example when downloading from internet). All the data source variables include specific error management routines. They can ask the user about the subsequent actions to perform after the error occurred. All the related displayed messages are fully customizable. Special variables consist of Expressions that can manipulate and evaluate text, numerical and boolean operations. They can make use of a set of predefined functions. Do you want to read some special local settings, check a file existence or format a text string? The Basic Setup Builder functions can help you. How many times your files to install, the text to display, etc... should depend on some condition to test? Do you need a simple way for switching alternative data? The Conditional variables do this, working as switch statements with multiple options. A conditional variable can input data from any other variable. 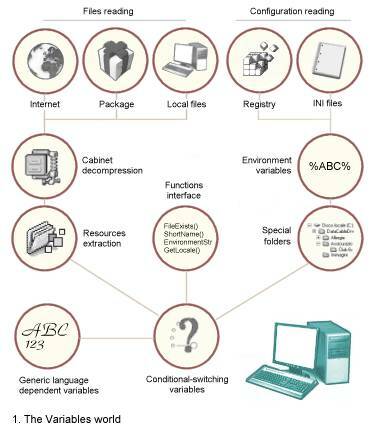 A generic variable can contain multiple language-related texts. Special syntaxes allow them to read system environment strings and special folders locations. Of course all the text and image controls on the installer form and backcloth can display variable contents. Also the visible/hidden state of some controls can depend on the state of one or more variables. Such controls are all dynamic and autosizing. After a variable has been changed all the controls that depend on it will reflect its new state. By using timed and conditional variables you can implement slide shows and billboards with a few of steps. Copyright © 2009 Amma software. All rights reserved.